Do you really need anti-pollution skincare products? When I first started seeing anti-pollution skin care products a few years back, I thought it was just another skincare gimmick - yet another “concern” concocted by the beauty biz to get people to buy new must-have products. I dismissed it as a marketing shtick targeting the urban consumer. After all, shouldn’t I care more about how smog affects my lungs and other vital organs? I already had a reliable skincare routine, so proper cleansing should remove all the grime my skin accumulates through the day. Or so I thought. Yes, the health concerns caused by pollution are very real, and that includes damage to the human body’s largest organ: the skin. As it turns out, studies have proven that exposure to air pollution (from manufacturing plants, vehicles, and tobacco smoke) truly does speed up skin aging much like sun exposure. What surprised me is that even those who stay mostly indoors are also at risk, and that another study has proven that indoor pollution is a real cause of skin damage. So, what exactly are these pollutants, how can they harm us, and what can we do to defend our skin from pollution? Some gasses that form part of polluted air have an effect of depleting our skin’s antioxidant stores. One example is nitrogen dioxide (NO2), which gets in the air as fuel is burnt by manufacturing plants and vehicles. Aside from its foul smell, it has been known to trigger asthma attacks and worsen respiratory diseases. It literally taints the human body, as it has been linked to increased skin pigmentation. We’ve been taught that the ozone layer protects us from the sun’s ultraviolet (UV) rays, but apparently ground-level ozone (O3) causes a drop in healthy levels of vitamins C and E. It is made when nitrogen oxide compounds (including nitrogen dioxide) and other air pollutants chemically react with sunlight. Exposure to ground-level ozone causes oxidative stress in the skin, leading to a breakdown in collagen, which leads to visible damage like wrinkles and hyperpigmentation. Another cause for concern is particulate matter (PM) - solid nanoparticles that have become part of smoke and polluted air. It may sound like a fancy name for dust, but PM can be too small to be visible to the naked eye. These nanoparticles are no bigger than 15-60% the width of the thinnest human hair! As such, these can definitely fit into and settle inside pores, and even penetrate skin cells to cause chaos at the mitochondrial level (scary, I know!). This can visibly manifest as wrinkles and pigment spots. 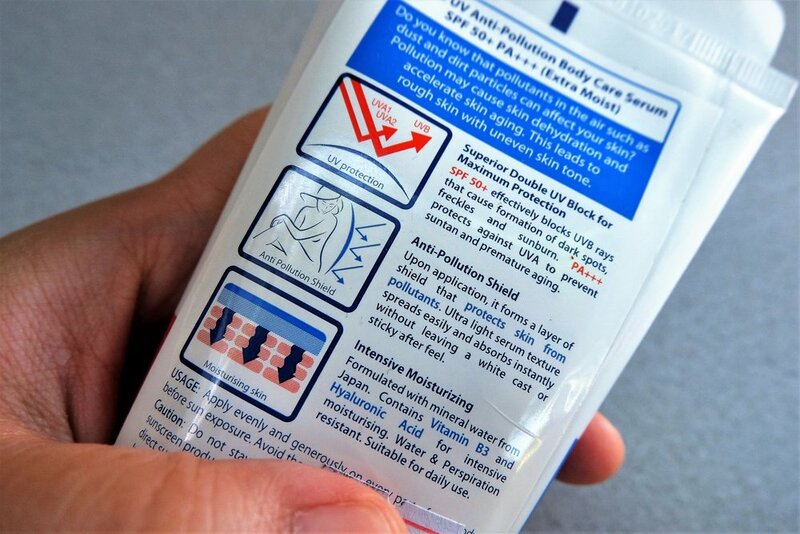 Worse, it can aggravate skin conditions like acne, atopic dermatitis, psoriasis, alopecia, and skin cancer. Pollution is a real threat to healthy skin, but you’d need to live in a bubble to avoid exposure. Since air pollution is inescapable, thorough cleansing is needed daily. BUT the products should be truly gentle, so your natural skin barrier remains healthy, intact, and able to protect you from these damaging pollutants. A low-pH face wash that effectively cleanses skin is a must. We also advocate double cleansing at the end of the day, to guarantee complete removal of makeup (and dirt + grime!). There are plenty of options for a “first wash”, including micellar water, cleansing balms, and cleansing oils. Exfoliation can also help the skin fight pollution. Physical exfoliants clear away the dead skin cells on the skin’s uppermost layer, while acid exfoliants like alpha hydroxy acid (AHA), beta hydroxy acid (BHA), and poly hydroxy acid (PHA) help clear away deep-seated dirt. Using the right combination of exfoliants can clear away dirt and other particulate matter from polluted air, as well as optimize the absorption of the rest of your skin care products. To combat free radical damage caused by pollution, look for leave-on skin care products with antioxidants. Vitamin C encourages the skin’s collagen production, as well as inhibits hyperpigmentation. Vitamin E protects cell membranes, and Coenzyme Q10 or Ubiquinone boosts energy production at the cellular level. Proudly local beauty brand Human Nature has released an affordable Pollution Defense line. Both the Pollution Defense Face Mask (P450/ 100g) and the Face Cleanser (P245/ 100ml) are fortified with “NaturProtect Actives, a potent blend of bentonite and kaolin clay, bamboo charcoal, moringa seed extract and antioxidant-rich passionfruit seed oil and vitamin E.” I like that these truly do provide a deep yet gentle cleanse. Den has also previously shared that the clay mask is a rare find for her dry skin, since it clears pores and brightens without irritating or drying up her skin. I find the cleanser non-irritating for my reactive skin as well, even though it does have a citrusy fragrance and leaves a cooling sensation on the skin. The Hydrating Emulsion (P345/ 50ml) is another great find, as it moisturizes well sans the heavy feel of a regular moisturizer. It’s also packed with antioxidants courtesy of moringa seed and passionfruit extracts, as well as vitamin E. Overall, I think the line is cohesive, and is easy to work into any skin care routine. I feel like it could use the addition of an essence or a serum, a concentrated, antioxidant-packed formula that can seamlessly layer with almost anything. Liz had nice things to say about Fresh Black Tea Kombucha Facial Treatment Essence (P4,127/ 150ml at Sephora.ph). It’s packed with antioxidants thanks to fermented black tea, green tea extract, and vitamin E. Two weeks of continued use resulted in more even-looking skin in her experience. Yes, it’s definitely up there in price, but it might be worth the investment if you’re looking for something to layer with (instead of replacing your current serum and moisturizer). We’ve talked so many times about the importance of sunscreen, so don’t forget to cover your body as well as your face! Bioré UV Anti-Pollution Body Care Serum is my go-to body sunscreen. I love that it has SPF 50+ PA+++ in a quick-absorb serum that moisturizes without ever feeling heavy, BUT I’m not entirely sold on its “Anti-Pollution Shield” claim. To date, there is no substance that can completely shield pollutants from the skin, assuming that saran-wrapping yourself from head to toe isn’t an option. It does have vitamin B3, vitamin E, and soluble collagen; but these are pretty low on the ingredients list. Don’t get me wrong: I make sure to keep a backup of this in my stash but with the more realistic expectation of straightforward sun defense. On the bright side, scientists are pushing standardized criteria and tests for a “Pollution Protection Factor,” similar to what we currently have for Sun Protection Factor or SPF. Syntivia, a laboratory based in France, has proposed several methods to test for this in vitro and ex vivo. Exciting times ahead for anti-pollution skin care! Aside from proper skin care, is there anything else we can do? Wear a face mask when you’re out and about. 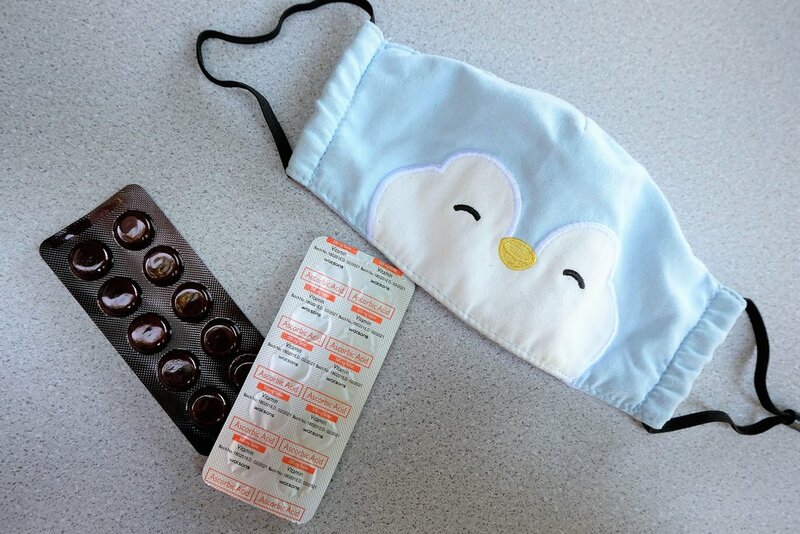 Disposable ones are readily available at pharmacies, but reusable cloth masks come out cheaper (and possibly cuter, too!). Just make sure to wash cloth masks regularly as you don’t want to keep exposing your skin to bacteria buildup. Cover pimples and blemishes with hydrocolloid or acne patches, even during the day. Doing so prevents harmful pollutants from aggravating your skin condition, and helps to speed up recovery without hyperpigmentation. Add antioxidants and vitamins to your diet to boost your body’s immunity and improve recovery rate. Avoid exposure to smoke whenever possible, including smoke from cigarettes, cooking, and burning trash. Don’t contribute to the current air pollution situation, and encourage others to do the same. Air pollution truly has become a skincare concern as evidenced by recent studies. Unfortunately, it’s not just a trend or a marketing ploy, although we should keep a vigilant eye out for products that use the phrase “anti-pollution” unsubstantiated. Proper cleansing, a good exfoliation routine, and antioxidant-rich skincare just might be enough do the trick. Do you have anti-pollution skincare in your stash? What convinced you to try it?